LOCATED ACROSS THE STREET FROM THE SUNOCO AND MARATHON GAS STATIONS AT THE INTERSECTION OF US HWY 1 AND CANAVERAL GROVES BLVD. 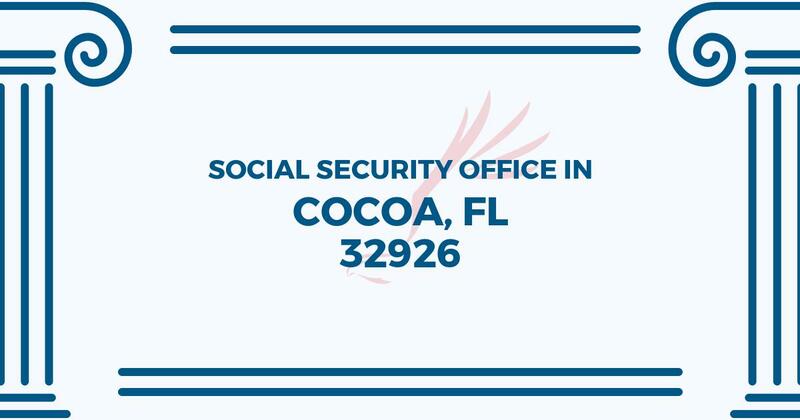 The Cocoa Social Security office is located in Cocoa 32926. The following page includes information for this location like the office phone number, hours of operation and driving directions. If you have any interests or comments about your retirement benefits or are interested in making an appointment, call the following Cocoa Social Security office. The Cocoa Social Security office is located at 310 Canaveral Groves. The Cocoa office offers information, assistance and services managed by the Social Security Administration. The following page features information for this location like the office phone number, hours of operation and driving directions. If you have curiosities or comments about your retirement Social Security benefits, or you need to schedule an appointment, contact the Cocoa Social Security office. my social security assisstance was not what is has been in the past almost $400 was not received. I am mentally disabled and depend on that income to pay my bills and eat. I want to know why my benefits were reduced.